A review by Barry Grantham for EXTRA! EXTRA! The dominant impression left after seeing The Birmingham Royal Ballet’s revival of Peter Wright’s ‘The Sleeping Beauty’ is one of grandeur, opulence, and luxury, right down to the snowflakes of gold-leaf that fall during the final chords of Tchaikovsky’s music. It is as if they wants to insist that this is no second company and Birmingham no second city. The set is rich, even sombre, with its’ impressions of Aubisson tapestries, gilded pilasters, and a threatening obelisk. Theatrically, this is effective, stressing the rigidity and pomposity of the court into which the young Princess is born, and it is cleverly enhanced by minute production details, like the bickering of suitorsand the arrogance of the servants. Of the costumes, words can hardly describe their splendour, Philip Prowse’s designs are superb, evoking the earliest years of the 18th century, a time which is perhaps the most elaborate and sumptuous in the history of fashion – and not only the design but their execution – the making of the costumes, principally by the ROH Production Department. The Sun King himself would not have been displeased to be costumed by them. 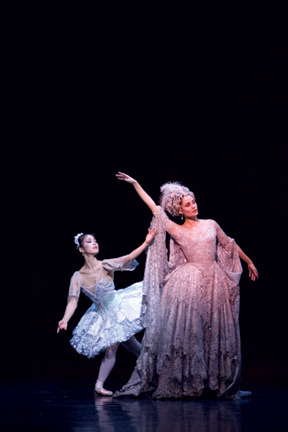 This magnificence is mostly expended on the non-dancing roles but also charming are the knee length tutus of the corps de ballet as they would have been at the time of the original St Petersburg production. I am loath to leave discussion of the costumes – I’ll just mention the hunting costumes of the prince’s party set a hundred years later, and I must now come to the dancing. You may have guessed that my enthusiasm wanes just a little – no, not too much. There is much to admire from corps, soloists, and principles. The truth is that there is now such a wealth of talent and technical proficiency, that one just doesn’t see bad dancing any more. Therefore one’s critical level is set at a much higher plane. Let us consider Nao Sakuma in the title role. Yes, a dancer of considerable ability and one deserving of the title of Ballerina – but of Ballerina Assoluta? I think not – at least not yet. To attain this requires an almost intangible quality not easy to codify. Is it authority and the ability to reach everyone in the vast audience, to make each and every step and nuance count, or a musicality that goes beyond just being on the beat? Iain Mackay is a pleasing Prince with the requisite noble bearing and skill as a partner. It was a relief to enjoy his solos after the rather endless (as I find them personally) ‘pas-de-chatring’ fairies – with his good elevation and soft landings – clean double cabrioles and excellent coupé jéié en tournant. Last night his tour en l’air tended to via to the left and one would have hoped for six pirouettes rather than a rather unstable three. In fact the company as a whole seemed to tire by the final act, as if they have not had time to build up stamina. The most famous pas de deux of Act III failed to attain the sublime and in the pas de quatre there was some distinctly substandard dancing. These faults occurred at this first performance and will no doubt be improved upon at subsequent ones. I have never liked the ‘animals’ finding them very childish, but the Bluebirds did shine with mastery of the very difficult Brisé-vole. Full praise for the good and evil sisters, the beautiful Andrea Tredinnick as the Lilac Fairy and the equally beautiful if sinister Marion Taite as Carabosse - with group of entertainingly malevolent attendants. I would not wish my strictures to discourage anyone from seeing the production. It is a splendid one and overall, a great night at the Ballet. Tickets: £15 - £60 Ring box office for concessions.